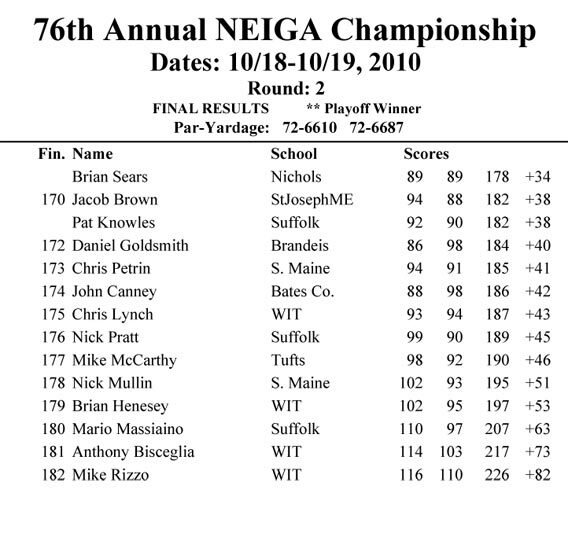 There were 44 New England colleges and universities as members and 37 that participated in the 2010 fall championship hosted at The Captains Golf Course in Brewster, Massachusetts on October 17-19. This location provides two par-72 golf courses and many volunteers to assist in numerous ways. The event includes housing, business meetings, banquet and an opportunity for sponsors to interact with players and coaches over a three-day event. Several coveted awards are presented during the players and coaches awards banquet. 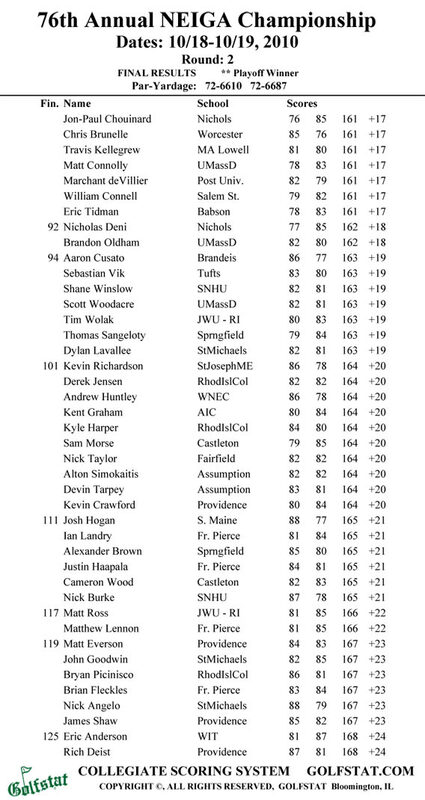 Teams from 37 colleges and universities across New England gathered Sunday through Tuesday, October 17-19, 2010 for the 76th Annual New England Intercollegiate Golf Championship. The event attracted 182 golfers to The Captains Golf Course and its 36-hole layout on Cape Cod. NEIGA was pleased to have Cleveland Golf / Srixon return as the ‘Presenting Sponsor”. 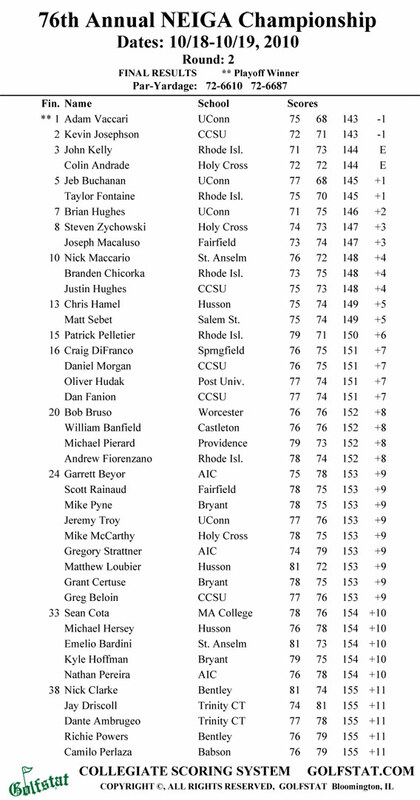 Adam Vaccari of the University of Connecticut defeated Kevin Josephson of Central Connecticut State University on the second playoff hole to finish as the individual medalist with a score of 143 over the 36-hole tournament. The University of Rhode Island (Div. I) , under the leadership of retiring Coach Tom Drennan, won the tournament for the 11th time in the last 13 years with a two-day score of 585 to edge the University of Connecticut by one stroke. 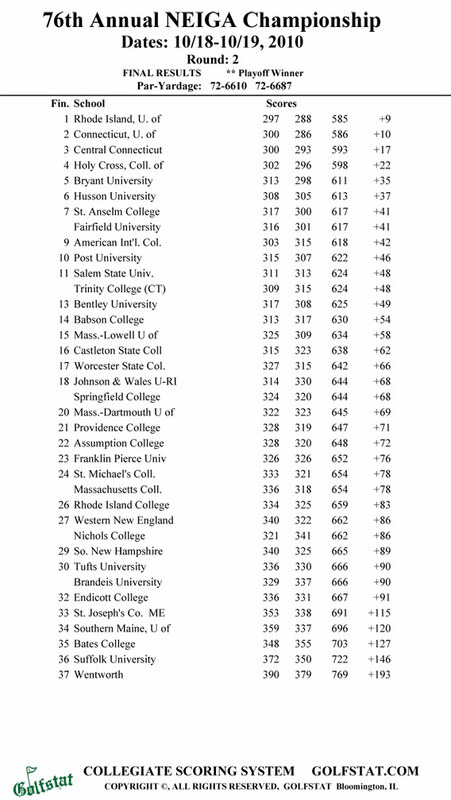 Division II was captured by St. Anselm College with a score of 617, one stoke better than American International College. Husson University led the Division III teams with a total of 613. At banquet held on Sunday evening at The Irish Village Restaurant, the following awards were presented. 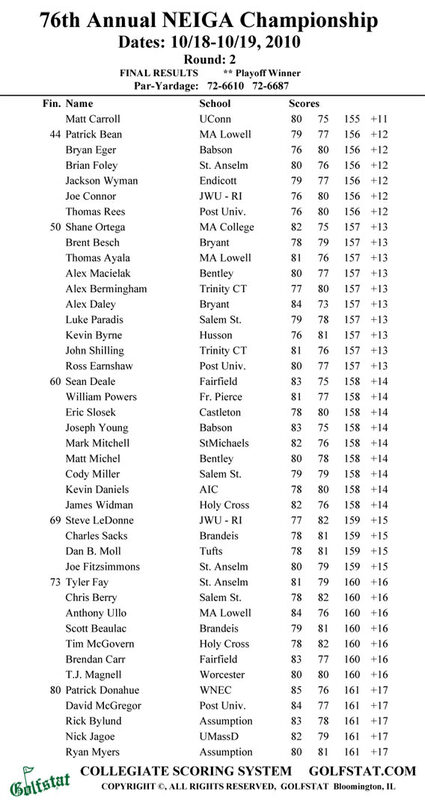 The 2010 of Guy Tedesco (player) Award went to Alex Daley of Bryant University, Leonard Roberto of Fairfield University was announced as the Gordon McCullough (coach) Award recipient, Frank Driscoll of St. Anselm College was presented the President’s Award, Barry Bruce PGA, former NEIGA medalist and current owner of the Barrie Bruce Golf School and Mike Dunphy of Cleveland Golf/Srixon received special recognition awards. Special events, all sponsored by Cleveland golf, were held on Monday afternoon at the finish of the first round. 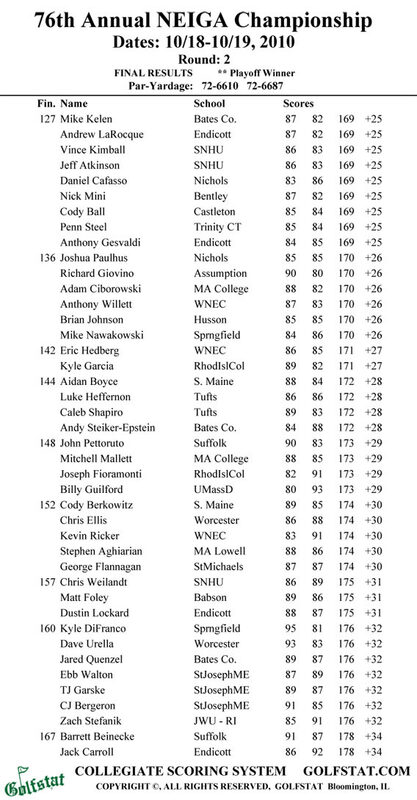 The long-drive contest was won by Shane Winslow of Southern New Hampshire University with a distance of 325.7 yards. Thomas Rees of Post University won the putting contest and the bunker contest winner was P.J Powers of Franklin Pierce University.